One very important consideration for a successful ministry to orphans is, "What happens when the orphans get too old to stay at the orphanage?" Many orphans have no family that they can even visit on special occasions, and the orphanage is the only "home" that they know. Too often, orphans that are living in a government-run orphanage in Eastern Europe are sent away at a designated age, and they end up homeless. Starting a life from "scratch" without any family support is very difficult. Our orphanage in Romania has been in existence long enough to have orphans that have "outgrown" the orphanage. We want to continue to be a support to any of these young people who need our ongoing involvement in their lives. We have now taken the next step for continuing success. Dorin, who is now 22 years old, came to the orphanage when it was first opened. He came from a very troubled home, where he was severely beaten by his father. Once at the orphanage, he thrived in the atmosphere of love that he found there. Recently, it came time for him to move out of the orphanage, but he really had nowhere to go. We are happy that we were able to offer our small mission house to him as a place to begin life on his own, and he is learning to accept responsibility and he is becoming more independent. 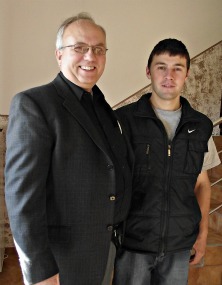 When we were in Romania a few weeks ago, we were encouraged by Dorin's progress. It is so rewarding to see the ongoing influence of the orphanage demonstrated in the lives of the young people who have experienced the secure atmosphere that it provided for them. Go to Hope for Eastern Europe (home page) from Continuing Success.